We’re almost at the end of the road. The front gardens and facades are judged tonight and the next few eps are fillers. Tomorrow night (Monday) the blurb says: Judges Neale, Shaynna and Darren play a game called Pimp My Pad Block Style, where they choose their all time favourite rooms from across every series to create the ultimate Block pad. They also rank the best rooms ever delivered. On Tues night: Visit the teams at home to find out what they’ve been up to since they moved out. Plus the houses are open for inspection as people get a chance to check out the homes before the auctions. 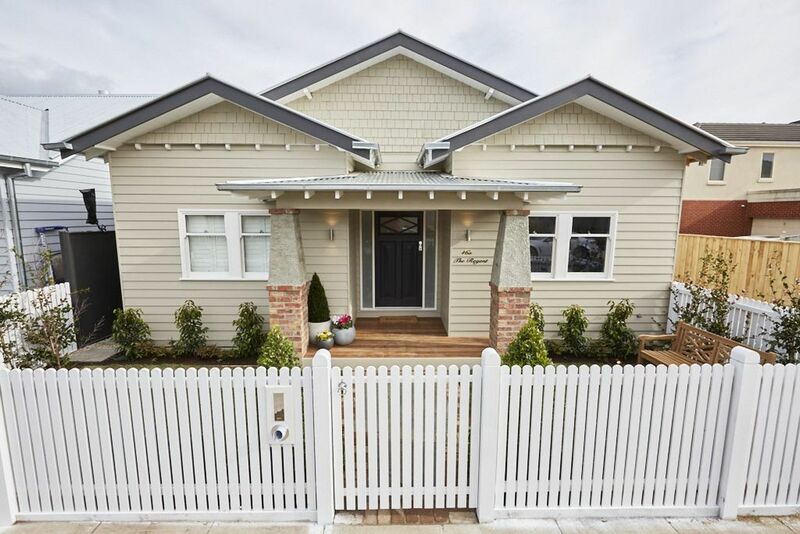 Why it is the sweetest little dream house drawls Shaynna. It has an amazing sense of harmony and balance adds Neale. Darren realising that he needs to actively contribute observes it was a masterstroke to restore the original door. In other words , if JS had not pissed off production they would have won this week. Maz, that looks ugly – Glad they’ve been judicious in selecting what should be kept and what shouldn’t. Not everything old is good – Josh. Totally agree about them not winning due to production despising them – shame cos their house has actually come out looking pretty good overall. Will be hilarious if they wind up winning the whole thing or perhaps their reserve will be higher to ensure it’s more difficult for them to win. Yep, talk all over FB is that they should have won. Shaynna was OTT on the plants in the corner of the deck with her comment about how exquisite they are. This was the best yard and the house has the best street presence, IMHO. Can’t believe I’m writing this because don’t want to like anything that JS did but it really looks nicer than the other yards and it should have won. Did they finish fixing everything? It feels like Nan’s house, Shaynna says dimissing JE’s exterior. Neale quickly agrees. The garden does not have the boho feel. Worse still, after a season bitching about what constitutes a California Bungalow, the judges are horrified by the authentic pillars. Darren feels that there is a buyer out there who will like the pillars. The pillars are true to the heritage but I’m with Shaynna & Neale. Don’t like them. Darren loves the bold exterior. Where the judges split is over the tiles. 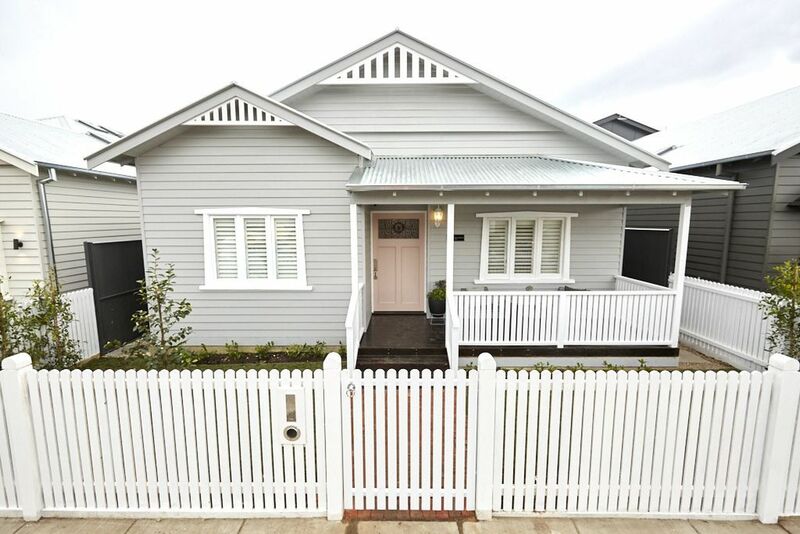 Darren thinks it is a great bridge between the picket fence and the black of the facade. Neale feels it is too busy and Shaynna think the tiles are too high maintenance. Neale wasn’t expecting this to be the exterior of RG’s house. Those tiles are going to be mighty slippery when it rains. looks good but not user friendly. Don’t mind the color of the house but the tiles need to go. Swweeet, exclaims Shaynna upon seeing the door. Hannah had decided to emulate Kourtney from Masters of Flip and paint the door salmon pink. The judges note the el cheapo carriage light has been affixed to the house crookedly. It doesn’t have the same level of finesse as next door. What no comment about the tea bag, Shaynna. Soooo disappointed. Actually in Brunswick not Moonee Ponds! Oops, sorry. Copied the wrong link. All good, I’ve been trying to find them all, but with not much luck. Maz, I was also expecting Shaynna to make a comment about that tea bag. Don’t like the pink door. Front yard looks confined/closed in. Let’s just say Sticks and Wombat take out the “Top Blokes” award with this win as the judges struggle to accentuate the positive. The judges like the colour scheme and the distinct lack of need of a lawnmower. I do not like SW’s deck or pillars. They look unfinished and cheap and seem to detract from the house. I also don’t like their pavers. Don’t think they should have won. I like JE colour the best and their most authentic pillars .I don’t like the ‘sticks’ used by SW and JS. 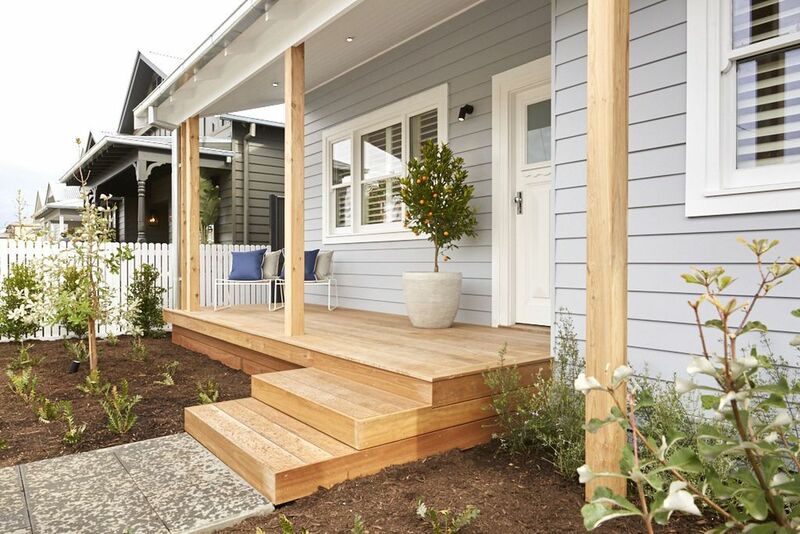 Or that bloody picket fence ln CH’s verandah. Ridiculous. Tessellated(?) tiles are Vic/Fed not bungalow. I don’t mind GR colour. Thanks for the recaps Maz, my attention span for the The Block isn’t strong, this weeks filler eps, won’t help! I like JE, CH (except the pink door – thou i have read this has since been changed), and have to say don’t mind JS – their use of the sticks is much better than SW. NOT A fan of RG Addams Family house at all. 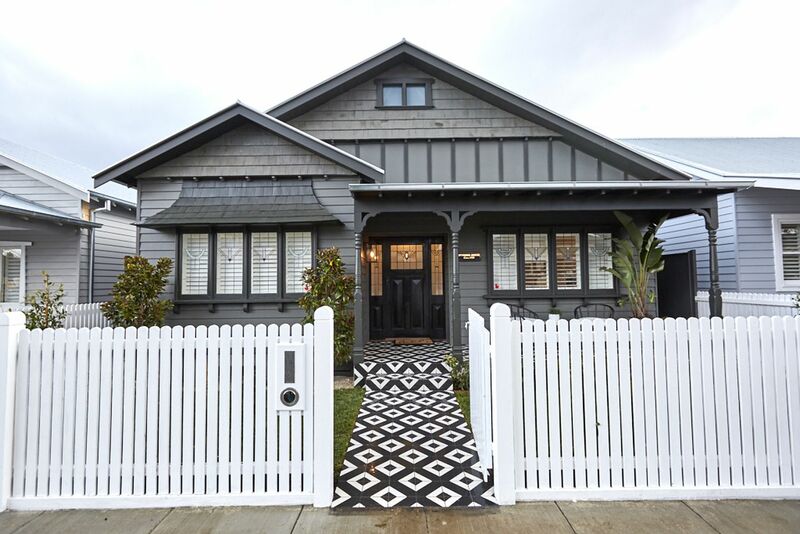 The tiles would give me a headache and the white picket fence just makes it look even worse, I have no idea where Ronnie got the idea that dark houses sell better! Or if it is just a case of trying to be different, then he needs to learn being different doesn’t always mean better! After flogging the 6 wins vs 6 wins to death all week, it was obvious that neither of those would win. Still glad that JE got a better score than the pompous pair. Personally I think that House 1 was the best of the five, but still a little bland. The very best feature of all five houses was the contrast colour (blue) on the gable ends of House 5. All the other houses are too monotone. I agree about House 2’s fence-within-a-fence. 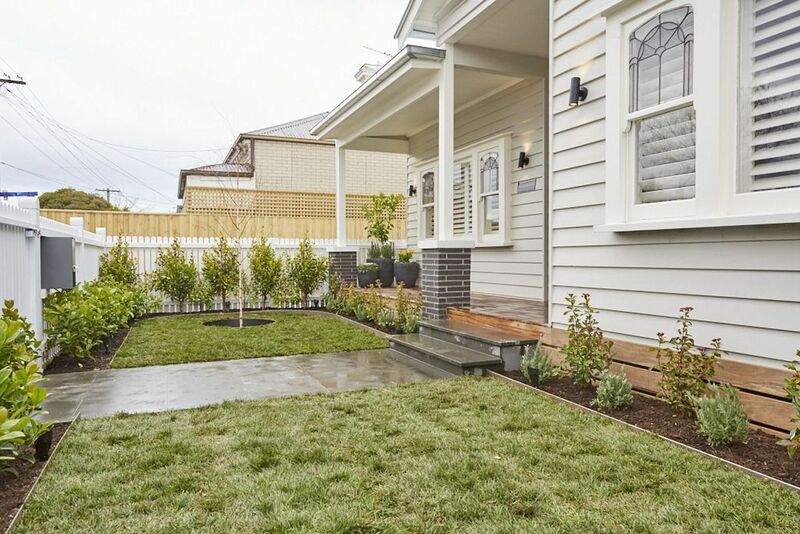 Shaynna reckoned that it promoted privacy but it was unnecessary with the actual picket fence and made the space feel cramped. Thanks again Maz for the summaries. The Block is seen in 166 countries, $cotty? I can’t get over that. These are the rooms that scored a perfect score at the time and ranked by the judges. (Bet you they regret giving some of these rooms perfect scores). Good move by HC to take out the spa, i assume the “the spa is buggered” is just an excuse to get rid of it. Jason is right, their house is more valuable without it. I’m curious where the money is coming from to get rid of the spa? However none of the teams should be concerned, unless HC get really lucky with auction order, i can’t see them winning. Thanks for the tip ,Erin. There’s not a single second of this season I want to relive. Thanks Maz, for letting me read about what I couldn’t stomach watching. Appalling work from Ch 9 for celebrating Wombat’s farting and rewarding maggots like Jason for bad behaviour. Thanks Erin. We have just finished watching last night’s episode. Just need to get through Monday’s. We do love ‘its a competition and rules must be adhered to’ only when it benefits Jason and Sarah. They bent the rules egregiously so they shouldn’t act aggrieved when another couple tries to do the same. Interestingly, Alice said that RG made a fatal mistake picking the middle house and should have kept 5 or taken 1. That is the $64 million question, where have the additional funds come from particularly JS when suddenly money was no object after Master Bedroom week. We are assuming certain couples will be screwed (or one in particular) when the reserves are announced. Bless, their little hearts, they all think they are house flippers now. I would assume the money would come from the “sale” of the spa? Surely it’s worth enough to buy decking boards? BTW, all the insurance policies that were waived in front of us will probably cover the repair cost. I couldn’t of said it better Dave. Channel 9 rewarding bad behaviour and having to listen to Elise ‘s bogan laugh and sense of entitlement has done my head in this season. Thanks for the recaps Maz. Thanks for the link Maz. I always thought there had to be some real brains behind the bad acting of Keith and Dan. We will have to stop posting links. As everyone knows it is a two horse race between JS & JE. Now there are dark hints that RG’s won’t sell. Why Ronnie & Georgia chose the middle house I will still never understand except that they wanted what was in the safe. They had 1st pick and the more intelligent choices would have been #1 or #5.